As I mentioned before, I just loves me a good thrift shop. And the DC area is loaded with them. It has that unbeatable combination of lots of people with too much money and too little space to store things indefinitely. They donate like CRAZY. And I do mean crazy. I find all kinds of clothing items in new condition, quite often with tags on them. It’s turned me into a clothing snob. I won’t buy cheap brands at the thrift store. Nope, I insist on the good stuff. With so much of it around, why settle for less? 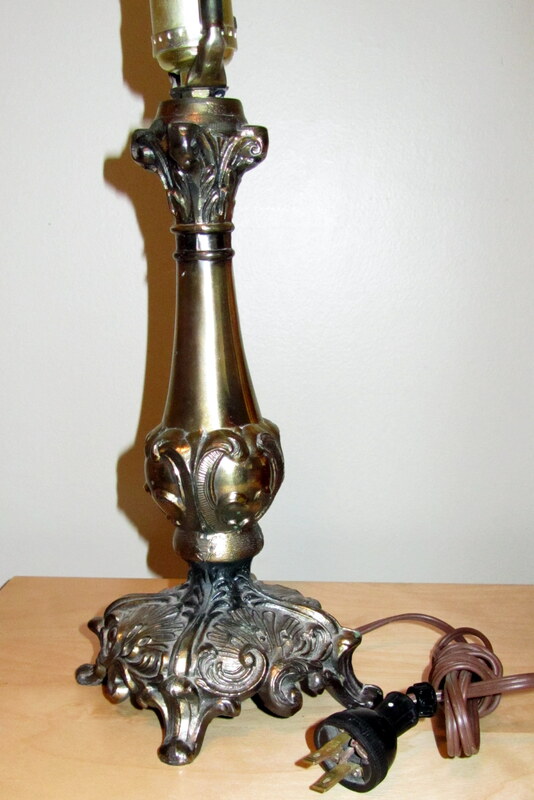 But I also like shopping for vintage or otherwise cool items for the house. Yesterday, I made a trip to Unique and scored some pretty! 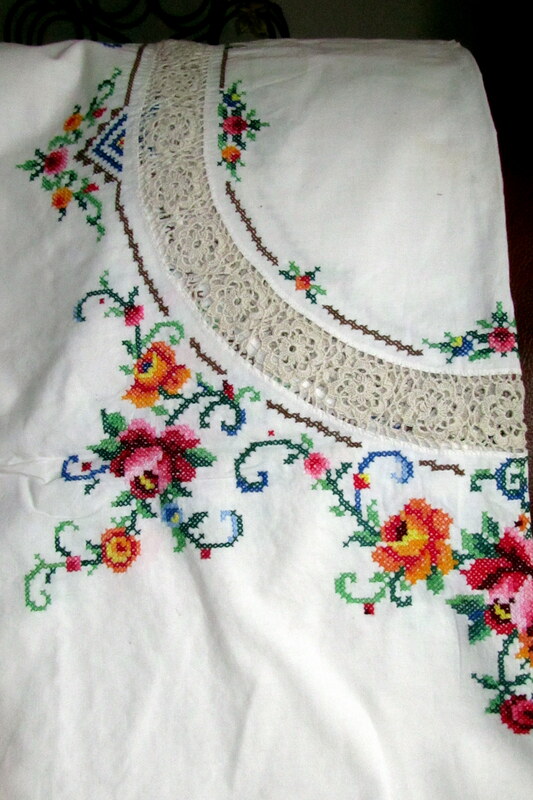 A beautiful, hand-embroidered tablecloth to start with. It’s more than big enough for my long table. I may be afraid to use it with actual food, but I’m sure it will find a place in the house. It was $20, which is more than I usually spend on these things, but it looks like new. 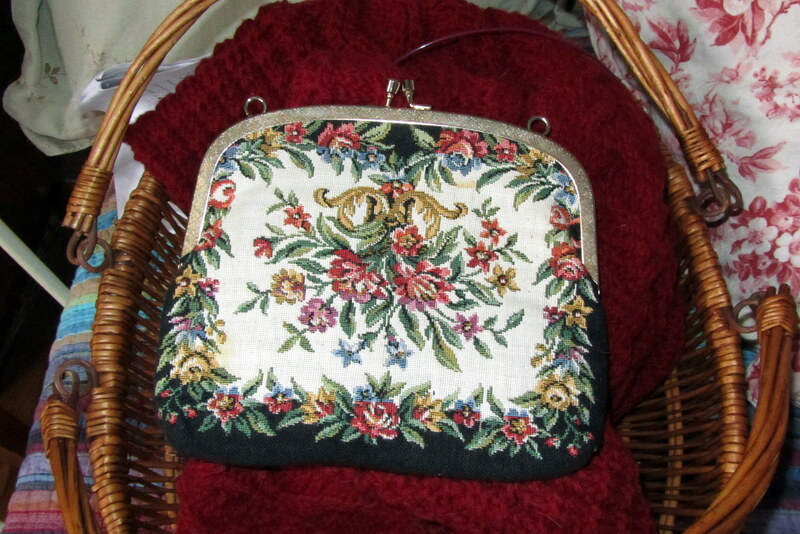 I got a couple of clothing items as well, and this little tapestry purse. I’ll use it for knitting notions. $3 worth of pretty for my knitting basket. Well, why not? I love Unique! I found so many great deals there last summer and fall. Yesterday, eight years after my divorce, I finally took my wedding dress to the local thrift shop. I don’t have daughters, and it is way out of style, so I finally took the plunge. I think I feel lighter.